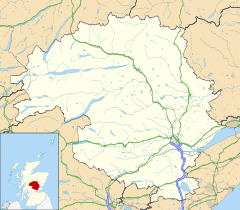 Grandtully (pronounced as "Grantly" and sometimes also spelt "Grantully") is a small village in Perthshire, Scotland. It is situated close to the River Tay, about 3 miles from Pitlochry. It has a population of approximately 750 inhabitants. Grandtully has a Church of Scotland parish church; it is now part of Grantully, Logierait and Strathtay Parish (within the Church of Scotland's Presbytery of Dunkeld and Meigle). In Nether Pitcairn, 3.2 km south-west of Grandtully, there is a church built by Alexander Stewart of Grandtully in, or shortly before, 1533. It is a low and outwardly unassuming white washed building that contains a wooden tunnel vault ceiling with tempera paintings from the early 17th century. The paintings show scenes and persons from the bible intermixed with the coats of arms of kings and noblemen, and in addition an abundance of birds, fruits and angels, all depicted in a renaissance style with cartouches and imitated metal work. The paintings were restored in about 1950. An earlier castle stood around a mile to the east and dates from 1414. Only its foundations remain. The current castle consists of a Z-plan three storey towerhouse of 1560 extended in 1626 to create a fortified house. In the calmer world of the 19th century extensive additions where made in the 1890s in the Scots Baronial style by Leadbetter & Fairley. The lands and castle belonged to the Stewart family from the 14th century, Thomas Stewart of Grandtully being mentioned in 1587. The castle was used by the Earl of Mar in the Jacobite Rising of 1715 and by Bonnie Prince Charlie in the 1745 rebellion. The property was modernised internally in the 1920s. It is now divided as private flats. It is said to be the basis of "Tully-Veolan" in Sir Walter Scott's "Waverley" novels. ^ Gifford, John (2007). The buildings of Scotland: Perth and Kinross. New Haven & London: Yale University Press. pp. 405–406. Wikimedia Commons has media related to Grandtully.